Your UberAIR taxi ride of the future needs a place to land. Uber's flying taxi service -- that glorious sci-fi dream -- still plans to launch its first takeoffs by 2023. One major caveat, however, is that unlike regular taxis which can freely zip about the streets, UberAIR taxis need access to the sky and a place to land. That's where "Skyports" come in: special areas localized specifically for launching, landing, and customer pickup, and they're looking appropriately futuristic. 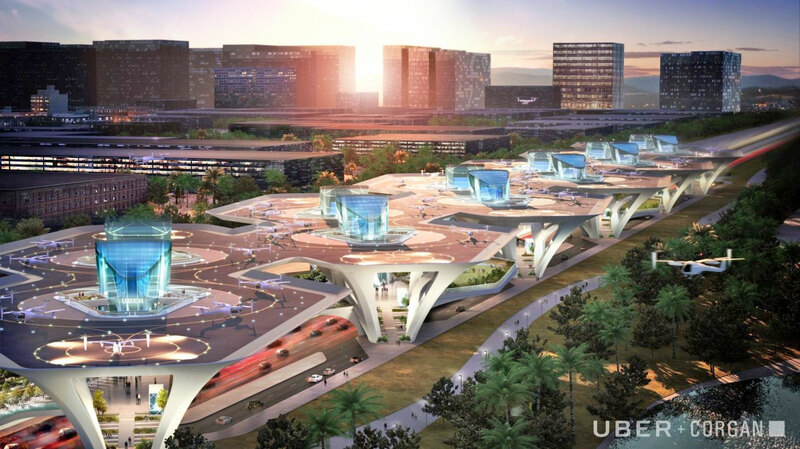 During the second day of Uber's Elevate Summit 2018, the company revealed concepts for its air taxi ports. 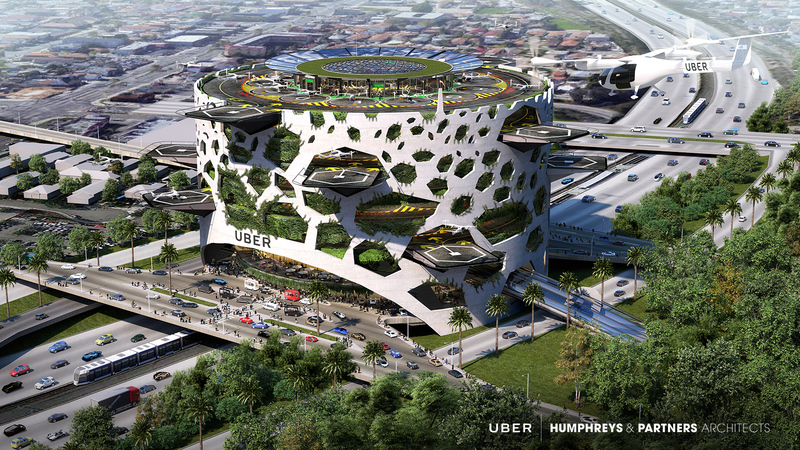 While still at the early developmental stages, Uber plans to support over 4,000 passengers per hour, per Skyport. These initial blueprints come from Corgan, an architecture firm keen on "transforming urban air mobility" with what it calls "Connect," an infrastructure that will enable up to 1,000 Uber eVTOLs (Electric Vertical Take-Off and Landing) each hour. The Connect system is composed of a single module that can be easily adapted for use on open sites like the topmost level of parking garages or skyscraper roofs. The module itself consists of four parts. First there's the Connection Plaza, a hub area which keeps the system tethered to pre-established highways, and provides a nice entryway for those rushing off to an important business meeting; the Bridge facilitates intuitive passenger flow. Corgan hasn't forgotten customer service either -- the hypothetical Station will apparently be a hotspot for urban commuters, and will offer restaurants, amenities and a shopping precinct. Lastly, the Flight Deck will be the part that connects passengers with their dedicated Uber air taxi pod. The firm added that each paired module can manage 180 landings per hour. According to Corgan's press release: "Our vision for Connect is to address the greater needs of the community and take advantage of the un-utilized space found above highways in every major city." A number of different Skyport designs have been submitted by other companies, too. Engineering company Gannett Fleming envisions a system that boasts up to 52 take-offs an hour per module and would accommodate 600 arrivals and departures, also within an hour. Imagine a cluster of smallish helipads glued together and you've got the basic idea. Other ideas take design cues from nature. Architecture group Humphreys & Partners, for example, is trying out a beehive structure (seen below) that will act as a nest for 900 passengers. During his presentation on stage, Mark Moore, the director of Uber's Aircraft Engineering Systems, said the company would be using an "all-electric battery" for the vehicles themselves and is "not embracing hybrid" systems as a solution. If you're worried about environmental noise, Moore claimed the air taxis will be around 15 dB quieter than a similarly sized helicopter, and said more companies are tackling "ultra-low noise signature efficiency" as personalized sky travel becomes more readily available. He believes that air mobility services could be 10 to 20 times safer than current helicopter trips -- the air taxi service will be operated by commercial pilots who undergo specific training -- but also feature some level of background autonomy after extensive testing, similar to Uber's self-driving cars. Uber has faced issues with its ground-based autonomous driving project and things are far more complicated when you're flying in the air. Moore emphasized that UberAIR's DEP redundancy (distributed electric propulsion redundancy) could help reduce the likelihood of mechanical accidents and crashes. There's only one way to find out. Uber plans to start aircraft testing by 2020.